Coming to a Library Near You, Food Truck Night II: Return of the Food Trucks! We’ve heard your requests for another, so join the Millstadt Library, Thursday, May 9th, from 5 p.m. to 7 p.m. for some food, fun, and music. 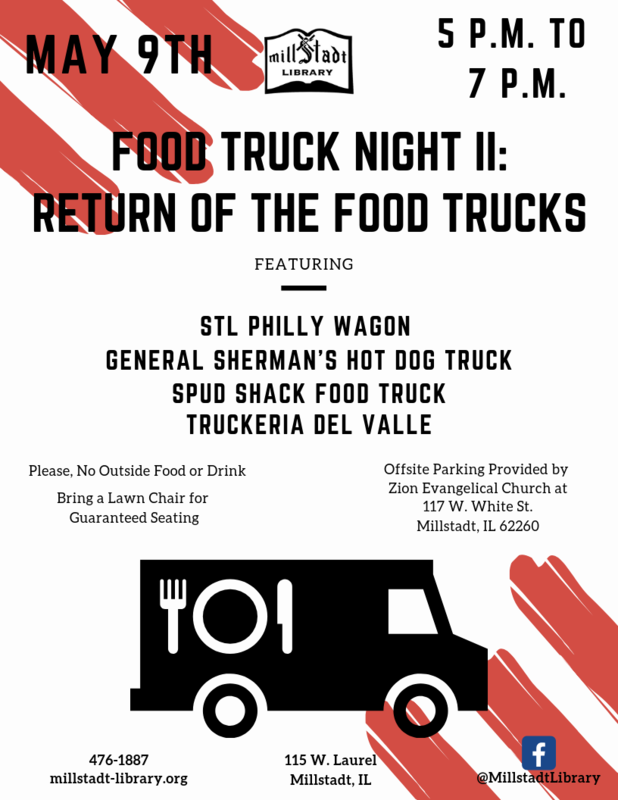 We’ll be hosting four local trucks, The STL Philly Wagon, General Sherman’s Hot Dog Truck, the Spud Shack Food Truck, and Truckeria Del Valle in the side yard next to the library, located at 115 West Laurel, Millstadt, Illinois, 62260. Offsite parking is provided by Zion Evangelical Church at 117 West White Street, Millstadt, Illinois, 62260. For guaranteed seating, feel free to bring a lawn chair and please, no outside food or drink. Just like our last event, we’ll have music and some activities to keep everyone occupied. Feel free to come inside the library to learn more about what we have to offer, how to get a library card, and to learn about our upcoming programs (like our Summer Reading Program!). For more information about our food trucks, check them out on Facebook! This sequel is going to be a good one.